A holiday to India is a journey through a complex history, a colorful culture and a varied landscape which stretches from the snowy caps of the mighty Himalayas to the luscious coast of the abundant Indian Ocean. The 6th largest economy in the world and home to a staggering 3 billion people, India holds within its territory some of the worlds most mythical and iconic sights and cities such as the eternal Taj Mahal, Varanasi, the Ganges River, the lush beaches of Goa and Rishikesh, the world centre of yoga, not to mention the lively capital of Delhi. This vast country shares borders with China, Nepal, Bhutan, Pakistan, Bangladesh and Myanmar, and its immense coastline, stretching for more than 7,500 kilometers, sits on the Indian Ocean, the Bay of Bengal and the Arabian Sea. Today, India is divided into 29 states and 7 union territories. Lovers of nature are spoilt for choice when they take a tour in India. With habitat zones ranging from tropical rainforests to alpine forests and deserts, India is home to a plethora of endemic plant and wildlife species, the former of which contributes to its strong culture of herbal medicine and Ayurvedic practice. India is famed for its varied and exotic wildlife including Bengal tigers, lions, Indian and white giraffe, leopards and snow leopards, the majestic Indian elephant and the mighty Indian rhinoceros. The country’s fantastically diverse wildlife is preserved in more than 120 national parks, although it is common to see wild animals roaming the city streets. Supporting such a wide array of wildlife, India is home to a range of geographical regions and landscapes, the most iconic being the Thar Desert, the snowy Himalayas, the lush tropical backwaters of Kerala and the unbelievable metropolises of Mumbai, Kolkata, and Delhi. With a history as vast as its size and stretching back as far as 5 millennia, a package holiday in India will open your eyes to a fascinating mix of traditions, cultures, and religions. Often called the ‘oldest religion in the world’, Hinduism is the largest religion in India, and across the centuries it has laid the foundations for the country’s culture and way of life. It’s founding texts, known as the ‘vedas’, were composed in India between 2000 and 5000 BC, marking the beginning of Vedic Culture, a key period in the northwest territories of the country. During these ancient times in the central Ganges Plain, the territory was divided into 16 kingdoms, known as Mahajanapagas. By the 4th and 5th centuries, the Golden Age of the Gupta Empire had unified much of the Indian Subcontinent and encouraged progress through a practice of Hinduism based on devotion rather than ritual which prompted a proliferation of arts, architecture, and Sanskrit literature. As the centuries moved forward so Muslim dynasties and the famous Mughal Empire left their mark on the story of India. During the Mughal era, from the 16th-19th century, popular monuments such as the Taj Mahal, Humayun's Tomb, Fatehpur Sikri, the Red Fort, and the Agra Fort, were constructed and reflected the artistic collaboration between both Persian and Indian architectural styles. The East India Company and the establishment of the British Raj also began in this era and its authority would continue until 1947 when Indian independence was declared. In 1950, a secular and democratic government was established marking the new era of modern India. Today, the colors, rituals, spirituality and vibrant culture of India are known and admired worldwide, so a package holiday to India is the best choice for a full experience of the wonders of the country. 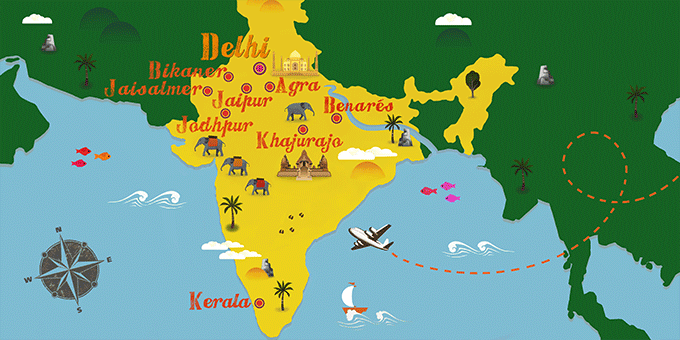 The world’s most populous country, India is known for its rich culture which varies from region to region. The official language is Hindi, although there are lots of regional languages that are widely spoken and English is the main language in which education and business are communicated. Religion is an important part of life in India and although Hinduism is the leading faith, Islam, Buddhism, Jainism, Sikhism, Christianity and ancient Zoroastrianism all contribute to the melting pot of culture and rituals. With a complex cultural catalog of beliefs and practices, concepts such as karma, dharma and the widely popular practice of yoga, all originate from India. Ancient languages such as Sanskrit and Sangam, are considered important pillars of culture in the country, although performing arts and music are at the center of India’s vibrant heart. Dances often act out myths, legends, and religious teachings and are an unmissable sight on a holiday to India. In recent years the Indian film industry, sometimes known as ‘Bollywood’, has gained recognition worldwide for its brilliant mix of modern and traditional values, opening up an insight into today’s India to viewers around the globe. Family values are another important pillar in everyday Indian life, with a multi-generational patriarchal structure being the most common structure of family life. It is also common for consensual arranged marriages to be organized for the younger generations. Traditional dress is a highly recognizable part of Indian culture, seen in the colorful fabrics and patterns of the ‘saris’ and ‘cholis’ often irresistible to visitors on holiday in India, who cannot resist buying the beautiful textiles to take home with them. From the immortal deserts of Rajasthan to the sleepy backwaters of Kerala and spiritual ghats of Varanasi, India is a must-visit destination for all intrepid travelers. If you dream of having your eyes opened to a different way of life, to unbelievable devotion, to the most vibrant colors of the spring Holi festival and to the smiles and friendliness of the local people, a package tour of India will deliver these dreams to you.